Last year at university I was so good with my cooking, I had weekly plans, a (relatively) healthy diet and trying new recipes every week. This year however has been a different story. I've been having the same meals every other day, been getting no way near my five a day and missing meals. I wanted to get out of this rut so turned to BBC Good Food website to get some Autumnal inspiration. If you're looking to save some cash too this is a clever way to do so as it will only give you fruit and veg in season. I followed this recipe by the Hairy Bikers. And I'm not sure why but some parts did just not work for me, especially the wraps. I don't know why but I feel that proportions were a little all over the place, so the recipe I'm posting below is more inspired by this then straight out copied shall we say. 1. 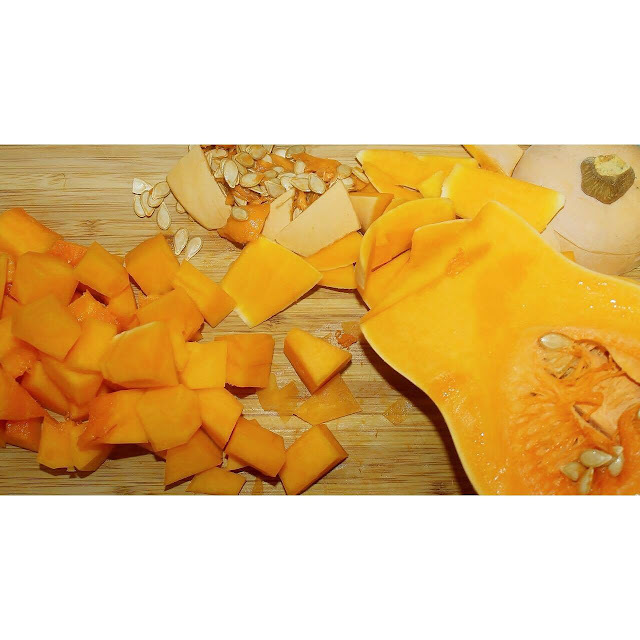 Allow some time for cutting up the Butternut Squash! Its difficult. Once these are diced put them in a frying pan with a little butter then sprinkle on the salt and pepper. Cook these around 6 mins and then dump in the cabbage which is shredded. Cook this with the squash for around 3 mins. If you are using honey for flavour put this in with mushrooms, but if you're using lemon put it in when they are nearly cooked. Finally add the pine seed for just over a minute and your filling is done! Unless you are a top chef, I would just buy these. I made mine and it added on so much longer then it needed to without really adding anything to the meal but a lot to my washing up. In the hairy Biker's recipe it says use a pint of milk. No. no.no.no. DON'T DO THIS. The sauce was the part I was looking forward to the most but this is just far too much milk and it is not a fondue but a sauce it you use this much milk. Because I obviously followed the recipe my fondue was tasty but just completely runny and not what I wanted. I've wrote a modified guide but these instructions aren't precise. Boil the pan with the milk in. Add in the Flour and the butter when still boiling. Put it on the lowest heat. Pour in the cheese slowly, this should be grated. If you feel it is too think add in more milk, but remember it is a fondue NOT a sauce. Mine doesn't look like how I'd hope! But I followed the original recipe, the above is my variation and it is a little bit of a guess! But I'm pretty sure it will work. What recipes have you been enjoying this fall?